1) The center of the circle will be the center point of our view. 2) Set the color of the arc. I am setting it to red color. 3) void CGContextAddArc(CGContextRef c, CGFloat x, CGFloat y, CGFloat radius, CGFloat startAngle, CGFloat endAngle, int clockwise). In this method (x, y) is the center of the arc; ‘radius’ is its radius; ‘startAngle’ is the angle to the first endpoint of the arc; ‘endAngle’ is the angle to the second endpoint of the arc; and ‘clockwise’ is 1 if the arc is to be drawn clockwise, 0 otherwise. ‘startAngle’ and `endAngle’ are measured in radians. I am taking the start angle as 0 and end angle according to the value of progress. Now in the selector method “progressClock” of NSTimer, set the updated progress value to the ProgressView’s object and then redraw the view. where _view is ProgressView object in the Xib, _progress is a class variable of float type initialised to 0 or initial progress value. And fullTime is the time in which you want to complete the progress/cicrle. Like if you want to fill the complete circle in 30 seconds, that means every second the progress should be increased by value (2*M_PI/30). So, here the fullTime will be 30. 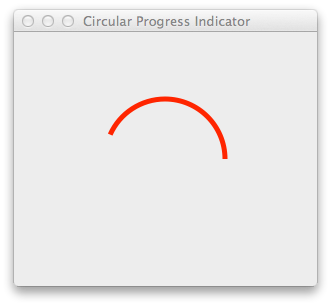 In this way you can easily create a circular progress indicator and modify it according to your requirements. Posted on January 27, 2014, in Cocoa Application and tagged Circular Clock, Circular Progress Bar, Cocoa, Custom NSView, mac, Mindfire Solutions, Neha Gupta, NSTimer, NSView, os x, Progress Indicator, Xcode. Bookmark the permalink. 3 Comments. hey @neha nice tut can i have working demo code it ? Thanks @neha. Any chance of a macOS version in swift? I’m lazy.